In 2014, Rocky Patel boosted their roster, scouting out (and ultimately signing) the revered Hamlet Paredes of Cuban Habanos fame. Paredes had become world renowned, working at both the famed Partagas and Romeo y Julieta factories in Cuba, as well as demonstrating tobacco seminars for tobacconists across the globe, and being among the most popular choices for connoisseurs of custom Cuban rolls. But fate would have it that Paredes and his family would soon escape Cuba, landing a role with the prestigious Rocky Patel Premium Cigars. As Paredes had never worked with non-Cuban tobacco, the task of blending a new cigar for Rocky Patel would be among his biggest challenges—ultimately leading to a new brand under his own name: Tabaquero by Hamlet Paredes. Tabaquero translates to “Tobacconist,” offering enthusiasts a special experience that combines old world tradition and knowledge with the rich and flavor-packed qualities of Nicaraguan, Mexican, and Brazilian tobaccos. A San Andrés wrapper covers a duel binder of Brazilian and Mexican leaf, followed by an all-Nicaraguan core. 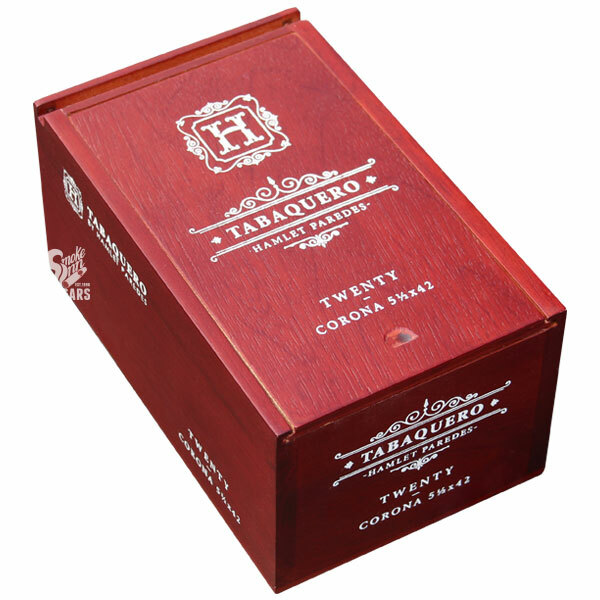 Branching out from Paredes’ “comfort zone” of natural shade habano, Tabaquero is his first true maduro; showcasing rich and decadent notes of java, wet earth, pepper, and chocolate fudge.